The Ragamuffin Parade steps off from the Lower School at about 9:00am on Halloween Morning: Wednesday, October 31st. Students from the Toddler Twos – 3rd Grade participate in the costume parade. All students from the Early Childhood Center (Toddler Twos, Nursery, & Pre-K) should meet in the Lower School yard at 22nd Street at 8:45am. All students from the ECC must be accompanied by an adult. The Toddler Twos and Nursery students will be dismissed after the parade and festivities, Pre-K students will walk back to school with their adult for a regular school day. 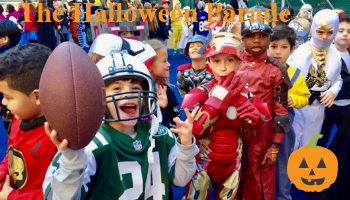 Parents of Lower School students are encouraged to walk along with the parade. On Halloween students at the Upper School will have a Dress Down Day & The Crazy Hat & Hair Contest, no costumes please. After lunch on 10/31 our Upper School students will be treated to a Halloween Improv Show. A happy and safe Halloween to all.